This Custom Front Exterior Entry is made out of Red Oak. 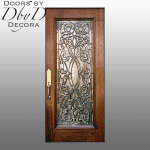 The 42″ X 96″ Radius Top Door is Custom with five solid panels and no Raised Molding. The Custom Wrap Around 14″ Sidelites complete the look with Clear Tempered Beveled Glass.